During my visit to Dubai in February 2006, I was able to attend the Annual Pedigree Pet Show at the ‘Nad al Sheba’ Racecourse. I found myself drawn to a stall for ‘K9 Friends’ which was being run by volunteers. They informed me that K9 Friends was a voluntary organisation which rescues and homes unwanted and abandoned dogs in Dubai and the Northern Emirates, and as I chatted to Jackie Ratcliffe, the Chairperson, she invited me to visit their kennel facilities at Al Barsha. Whilst at the ‘Pet Show’ I became acquainted with a beautiful, cream-coloured, ex K9 dog called Emma who belonged to a nice young woman who was working temporarily in Dubai. 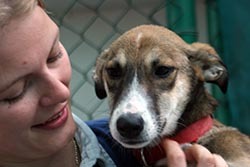 Emma was obviously happy and doing very well with her mistress, but I later discovered that so many dogs in that position find themselves abandoned when their owners leave the country because of the enormous costs involved in shipping these four-legged friends to their own homelands. Some of the dogs are lucky and are found new homes but there are just as many left in the villas or flats hoping they will be discovered before their food and water runs out. On the day before I was due to leave Dubai, I decided to take Jackie up on her offer and took a taxi over to the kennels in Al Barsha. After many wrong turnings in the industrial area, and at great expense, because the driver allegedly didn’t know the way, I eventually arrived at my destination, where I met a nice young lady who was working with the dogs. 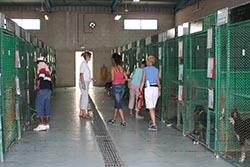 She took me into a large warehouse which housed 25 large kennels with two or three occupants in each. As we entered the warehouse the noise of approx 75 dogs all barking at once was enough to make me want to cover my ears but I know they were just all saying hello to me. 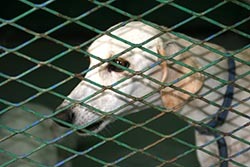 I was drawn to a small, pretty, smooth haired female Saluki, called Dani who looked at me with sad, empty eyes through the door of her kennel. It made me cry because there wasn’t anything I could do to help her. I would have gladly set her free and taken her away with me but I was leaving the next day. It was then I took out my first sponsorship on Dani for Dhs 300 (approx €60), a donation for one year to help towards her keep. 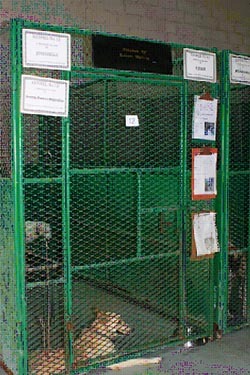 It costs K9 Friends about Dhs 3,000 a year to look after one dog at the kennels. Through my sponsorship I started corresponding with Judi Blyth, another K9 volunteer, and over the last year we have exchanged many e-mails. 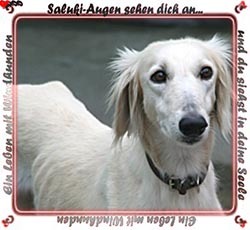 Because she discovered my love for Salukis, Judi told me that three, beautiful cream-coloured ones had arrived at the kennels after being found wandering in the desert. Their coats were in poor condition and they all had sore feet. I was so glad I hadn’t seen these poor creatures at the K9 kennels, dog homes have always been a real horror for me, sadly awakening a few childhood memories. 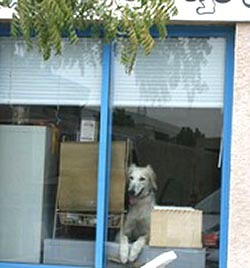 Many years ago I visited a dog home with my grandmother who was looking for a watch dog but in the end, to my disappointment, she didn’t take one. 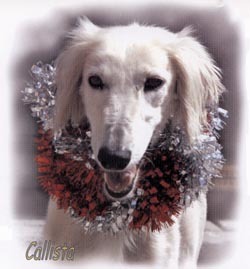 My sponsor dog, Dani, was soon homed and she was replaced by Callista, the first of the purebred Salukis to arrive at the kennels. All three dogs arrived within twelve days of each other which everyone at K9 Friends thought to be rather strange; they all looked so similar they could have been related. 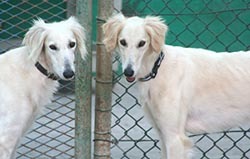 It was thought these beautiful dogs could have been abandoned by the same person although they were found in different areas, Gina actually being found near the runway at Dubai airport. After seeing their pictures I felt really sad for the other two, Gina and Reese; how easy it is to touch my heart! I decided to send more money to sponsor them too and help towards their upkeep for the coming year for which I received their certificates and some beautiful photos. To my great joy, it wasn’t long before my three handsome Salukis in Dubai found good homes, Callista, my favourite and the most beautiful of all, is now living in Scandinavia. I do hope for my favourite dogs that they all live full, long, happy lives in their new homes. I have now renewed my sponsorship for a further year but as there are no purebred Salukis at the kennels, thank goodness, I have been given ‘Rowdy’ who looks to be a Saluki/Greyhound cross. Because there are so many abandoned, un-neutered dogs these mixes occur quite frequently in the UAE. 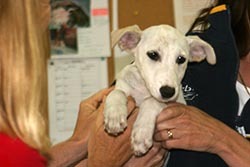 Rowdy was about four months old when he was found in Al Ain together with two other stray dogs. His name does not really fit his personality at all, this beautiful 2 year old dog, who is still only a teenager, is actually very quiet and gentle. I think mixed-bred dogs have exactly the same rights as pure-bred dogs to live a happy life so I wish for my new sponsor dog to be placed quickly in a good home. I will keep my fingers crossed for him. If I have the chance to travel to Dubai again I will definitely visit young Rowdy and my friends at K9. Thank you to everyone at K9 Friends and particularly to Judi for her continuing correspondence and friendship. They ARE friends to me and I am pleased to belong to them now by mailing lists and letters. I was very pleased to hear recently that after a threat of eviction by their landlord at the end of their current lease period, the Government of Dubai have stepped in and offered a piece of land on which to build a new kennel facility. 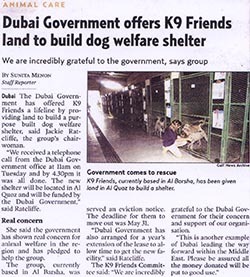 This is great news for the many homeless dogs in Dubai, as now K9 Friends can continue their good work. 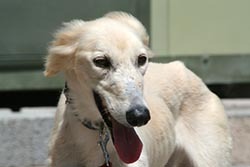 I wish K9 Friends all the best for the future in rescuing and re-homing the many abandoned dogs of the Emirates.